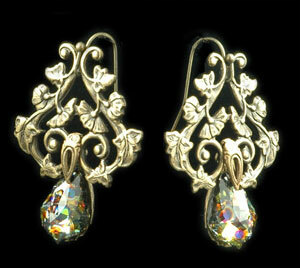 Lovely little art nouveau style antiqued gold brass filigree holds stunning, rare Peacock Crystals in its grasp. Peacock stone has beautifully multi-colored points of color inside which resemble the beautiful feathers of a Peacock. Must see to appreciate the beautiful variations of color they hold.